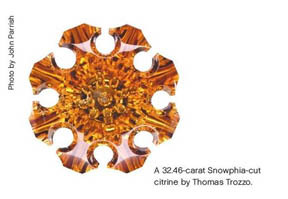 Article: A Superior Cut : John Dyer/Precious Gemstones Co. Whether on the wholesale or retail level, a diamond’s cut is critical in any sales presentation. In fact, a great many diamond companies make the quality of their cut their primary marketing focus. Brands such as Hearts on Fire have made large inroads into the market and command significant premiums over non-branded and standard-cut diamonds. The term ‘ideal cut’ is widely used and a great deal of time and money has been expended on studies to define the ideal angles and proportions that allow the most dispersion and brilliance in the standard round brilliant-cut diamond. Such efforts are evidence of a cut's effectiveness as a marketing tool. The correlation between a high quality cut and a finished diamond’s overall brilliance and beauty has been shown many times throughout the years, particularly when conveying its association with quality and exclusivity. Sadly, in the midst of all the attention given to a diamond’s cut, the same consideration for coloured gemstones has fallen largely by the wayside. Consumers and tradespeople are often taught that colour matters most in a gemstone, while cut is the least important factor. Many never stop to consider if this way of thinking is perhaps outmoded or ponder whether cut can also provide the same kind of marketing cachet and generate greater profits in coloured stones as it does in diamonds. As a master gem cutter who has won 28 cutting awards, it's been my experience that a high-quality cut can influence the colour of a finished gem and greatly increases its salability. The market for well-cut coloured gems is a sleeping giant of demand just waiting to be awakened for our financial benefit. 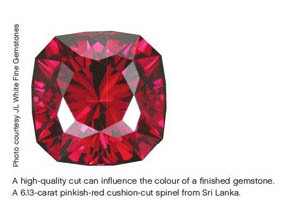 Since colour is integral to a gem and is influenced by cut, why in the world would anyone want a poorly cut stone? A low-quality cut gem often ‘windows’ out because it is cut too shallow, resulting in a lighter hue in the centre with a donut-shaped ring of brilliance and better colour around the outside. Surely if all you want is a ring of colour, you would be better off buying a bag of Life Savers. In contrast, a well-cut gem has relatively even colour throughout, preserving that which we value so much in a coloured stone. Attention to cut in a coloured gemstone is gradually dawning on the market as a whole. Gem-cutting is improving in many places around the world and well cut gems are coming on strong with more attention paid to quality and proper angles. Increasingly, foreign commercial operations are upgrading their facilities and adding new modern cutting styles such as concave faceting, which is currently the flavour of the hour in overseas cutting. I truly believe we are on the verge, if not well into, a renaissance in the way people look at cut in coloured gems. The marketing possibilities are endless and as I often say, people buy gemstone jewellery because it is pretty. Therefore, it should be as pretty as possible. Why settle for less than a well-cut gem when it is clearly available? The lime citrine on the left is slightly windowed and very poorly cut. The gemstone to its right is the same gem after recutting. 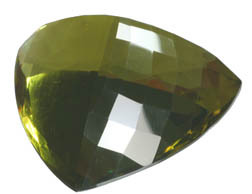 Notice the ‘fogginess’ of the gem before recut, the small window in the middle and lack of symmetry. With coloured gemstones, the difference between a good cut and a bad or mediocre one is often far greater than the difference between a standard brilliant-cut diamond and one cut to ideal proportions. Indeed, the quality of polish, proper angles, a unique cut design and many other factors are obvious and often easily visible to the moderately educated customer. Once consumers begin to understand these things, you can be assured they will be extremely discerning and unlikely to buy any stone that does meet a certain level of cutting quality and beauty. This provides one more avenue for wooing customers to your store or brand and keeping them, as well as further building your image of exclusivity and value. The first step toward educating a customer is to educate yourself and your sales staff. Rather than viewing this as a lot of work, I would encourage you to see it as an opportunity to be one of the first in your market to understand and promote the wonderful world of cut in coloured gems. In time, everyone will be doing it, so it is best to stake out your piece of this growing market first. It is important to remember that there is no ideal cut in coloured gems, no one cut or set of angles that is always best. While diamonds are sold mostly in a round cut and almost all have 57 or 58 facets, coloured gemstones are a whole world of their own. I like to say a well-cut diamond says, “Me too!” while a well-cut coloured gem says, “Uniquely you.” The wide range of cutting styles, shapes, and qualities can seem daunting at first. However, this depth of variety offers the opportunity to best express your client's individuality. It is absolutely possible to have a coloured stone that is cut unlike any other, given there are a number of gem cutters who approach cutting as an art form just as much as a science. These artisans are one of your best sources for learning more about cut in coloured gemstones. They invest a lot of time, care, and thought into the cutting process and most are happy to discuss the ways to discern a quality cut or share other insights into their art. Some of the choices a cutter makes go unnoticed by those who are unfamiliar with the subtleties of gem cutting. Each gem material refracts light in a different way and thus, the angles used on each material are often different. Possessing a keen understanding of optimal angles for each gem type is vital to any cutter of coloured gems with a high standard of quality. However, maximum brilliance is often not the only thing to be considered. Other factors come into play such as colour, location of inclusions, cutting style, the shape of the rough, and colour zones. Additionally, a particular cut may be ideally suited to a certain gemstone but not another. 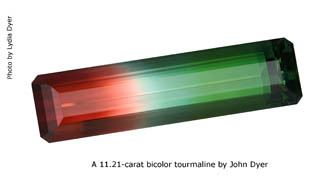 For example, a cutter may want to accentuate the colour division in a bicoloured tourmaline rather than its brilliance. Or he or she may change the angles by a degree or two and arrange the facets to maximize the gem's brilliance as much as possible without negatively affecting its colour. Often, light can be made to take a longer or shorter path through a gem with the proper use of angles and facet arrangement, thus increasing or decreasing the apparent saturation to a certain extent. It is in subtle details like these that the true masters of gem cutting separate themselves from the mass market cutters and show their worth. In the realm of volume cutters across the globe, many companies have begun to understand the concept of not cutting the gem so shallowly that it windows, thus improving the appearance of the average commercially cut gem. However, quality cutting goes so much further than this. Many commercial cutters rely on very primitive means for setting angles. A difference in angles as subtle as three degrees can be very difficult to judge while cutting on more primitive machinery and can greatly affect the stone’s final appearance. If cut three or more degrees too shallow, a gem will window. Although a stone will not window when cut three degrees too deep, doing so will deaden its brilliance. Factors such as polishing, symmetry, meet points, and cut design also distinguish those gems cut by a true artisan from even the better-quality commercially cut stones. 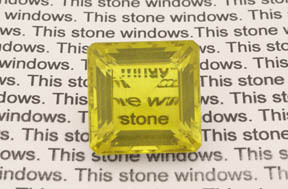 I would encourage exploring the potential for originality a well-cut coloured gemstone can offer your customers. From flat-faceted classic shapes with improved brilliance to far-out combinations of carving and cutting techniques, there is a gem out there to fit almost every taste. This poorly-cut lemon citrine is windowed. Notice you can read the underlying text through the gem's centre. The main cutting styles available in the marketplace today can be classified in three categories: flat faceting, concave faceting, and combination cuts. Each has its own unique attributes, advantages, and disadvantages. 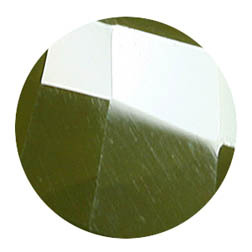 Flat faceting is the most traditional and familiar of the gem-cutting techniques, but it needn't be boring by any means. 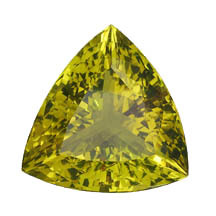 There are many different faceting patterns that allow greater brilliance, unique shapes, or effects to intrigue the observer. Frosted facets are also sometimes used for contrast. Well-executed flat faceting is one cutting style that can appeal to the more traditionally minded customer, while offering something a little more brilliant or unique than its commercial counterpart. Concave-faceted gems are all about brilliance and outline, with a very bright glow that is hard to equal with flat faceting. 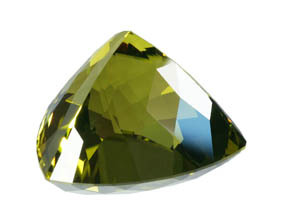 Also, they can often be less deep than a flat-faceted gem with a similar appearance. They do not, however, have the scintillation or sparkle of light moving from one facet to the other; the appearance of a concave-cut gem is pretty constant even when the gem is moved in relation to the eye. At times, the cutter will also put concave indents in the girdle to achieve a unique shape, often resulting in lower yield, albeit with a very cool look. Combination cutting is about creativity. Pretty much anything goes in this broad category and many different techniques are used, often all on the same gem. 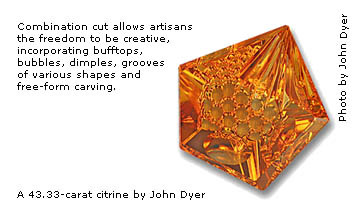 A short list would include flat, concave, and convex facets, bufftops, bubbles, dimples, grooves of various shapes, and freeform carving. The techniques employed are limited only by the cutter’s creativity. Combination-cut gems offer the greatest variety and often challenge many traditional concepts of gem cutting. With some designs, a brilliant and interesting gem with a very shallow depth can be achieved that would be impossible with either concave or flat faceting. This is very handy when designing a brooch or pendant that will not be too deep. 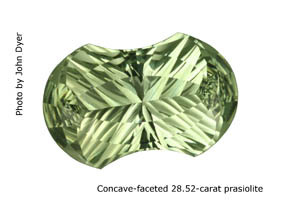 With their oftentimes very unique look combination-cut gems are not for the customer who is faint of heart. Rather, they offer creative or artistic types a stone to match their soul. You will find that gems (especially those that are well cut) are almost an addiction, yet as with any addiction, it is vital to get your customer hooked on them. What the eye has not seen, the heart cannot desire. Given this fact, it is important to stock well-cut gems to awaken customers to their existence and arouse the passion and desire to own them. After that, they will probably sell themselves. Generally speaking, a gemstone cut by an artisan can cost about 20 to 40 per cent more than its commercially cut counterpart. This is due mainly to the increased cost of more highly trained labour and the time involved to cut the stone. 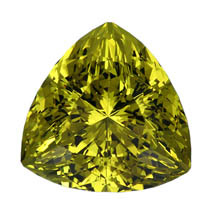 While commercial cutters with substandard quality can often turn out 8 to 20 gems per day, the custom cutter usually takes a minimum of three hours on a faceted gem and often a day or more on those involving multiple techniques. However, as the value of the gem material increases, the cost of an artisan's skill means less to the overall price of the stone. For example, an artisan spending 5 to 6 hours cutting an inexpensive gem will need to make at least $200 just to pay for his or her time and investment while a commercially cut gem in the same material may cost about $100 including labour. In contrast, the more expensive material may cost $2,000 when cut by a commerical cutter and only about $2,400 when cut by an artisan. So often, it is true of the jewellery trade as a whole that we who are trying to sell class and sophistication love to save a penny even when this hurts us in the long run. No doubt, many people's reaction to this article up to this point is to think that nice cuts are cool. Yet, few would pay an additional 20 to 40 percent for a coloured gem when their customers don't know the difference. The fact is, customers who come to admire the beauty of a well-cut gem are more likely to purchase one even at a slightly higher price than a commerically cut stone. Compared to the cost of diamonds – which can vary up to 50 percent in value based on the cut alone – the price difference is quite insignificant. 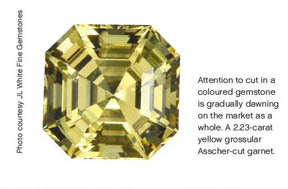 In this respect, it can be argued a well-cut coloured gem is a far better value. The cachet of a well-known or award-winning cutter is also something customers can appreciate – many cutters have reached art status and are practically a brand unto themselves. Also, in many cases, the cutter is happy to provide further information about the different aspects of cut in coloured gemstones. This kind of individual attention and relationship with the cutter is often impossible in the diamond industry due to its shear scale and similarity among the merchandise. John Dyer is a gemstone artist who has been cutting gems since the age of 17. He travels widely to procure rough gems, selling his unique creations to jewelers and designers worldwide. 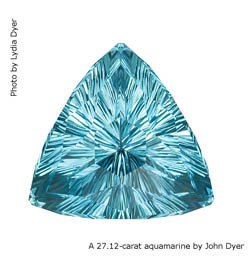 Dyer loves the challenge of extracting the maximum beauty from each and every gem and is the winner of 28 cutting awards. He can be reached via www.johndyergems.com. The photos above illustrate the effects of poor polishing (see zoomed view). Also visible are the facet junctions that don't meet. Facet surfaces should be free of scratches and the facet junctions should meet perfectly, as illustrated in the stone on the left. 1. To determine if a gemstone is windowed, hold it over a white surface. Check whether the center of the gem is brilliant and whether you can see through it. If you can read type or other lettering through the gem, it probably has a window. 2. Is the gem is symmetrical? Verify whether each side is the same length and all corners are of the same width. Often, a gem just “looks wrong” and this is due to the lack of symmetry. 3. Examine the polish using a loupe or other instrument of magnification and look for partially reflected light shining off the facet being examined. Move the gemstone until you find the angle that allows light to reflect off a facet and for the polish to be clearly visible. 4. Check the girdle to determine it has the proper width and is fairly even all the way around. This is especially important when it comes to setting the gem in jewelry. “Knife edge” girdles are a goldsmiths nightmare to set without breaking. 5. Inspect the “meetpoints” (see lime citrine above). While this does not have as obvious an effect on beauty, it does show craftsmanship on the part of the cutter and is a sign that he or she probably took greater care in other aspects as well. 6. Examine gem's brilliance. Is it even and bright throughout or does the gem only sparkle in some areas? This can be a sign of poor cut design. 7. Consider the gem's ‘tilt” performance. Tilt the stone and determine whether there is a window in any of its sides. Virtually all gems “spill” light when tilted far enough. However, the effect is lessened in gems with a better cut and higher refractive index (RI). This is one of the measures that requiring experience to discern – the difference between what is normal and unavoidable as opposed to what is the result of inferior cutting. Lastly, look at the cut's overall design and aesthetic appeal. Although this is probably the most subjective of all the judgements, it is important that the gem have a lot of visual appeal. While this can vary a lot depending on the cutting style, remember, gems should be beautiful and beautiful gems sell.